This Easy Salmon Pesto Pasta is ready in less than 20 minutes. Penne pasta topped with homemade basil and pine nut pesto, peas, Parmesan cheese and salmon. Looking for a quick and simple weeknight dinner? You’re in luck—this Easy Salmon Pesto Pasta is a fancy homemade pasta meal ready in less than 20 minutes. This even includes cooking the pasta. If you have pesto on hand or use store-bought, it’s even easier and can be made in just a few minutes. Having plenty of fresh herbs growing in our patio, I prefer to use them as often as possible. Whether it’s in a marinade, sauce or as a garnish, it’s an easy way to punch up flavor in a dish. Homemade pesto is a versatile item that can be used in many recipes, plus you control the quality of ingredients and flavor. This Easy Salmon Pesto Pasta has plenty of time-saving tips. Beyond the option of using store-bought pesto, I suggest using cooked, canned salmon. It’s almost always wild-caught, cooked and ready to go. 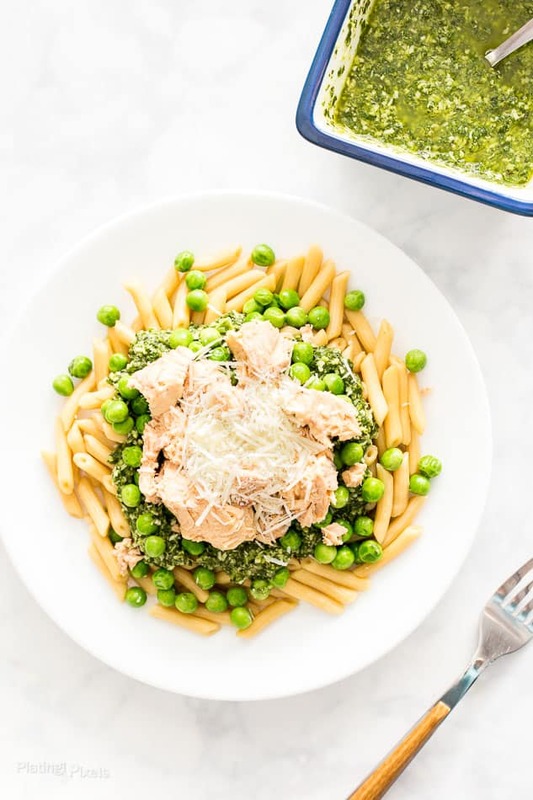 Once you have all the ingredients and pasta cooked, simply assemble this Easy Salmon Pesto Pasta. 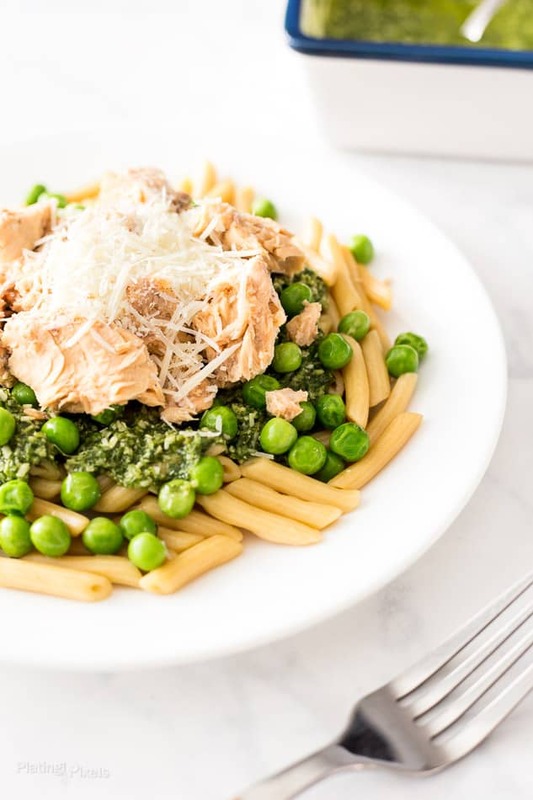 Start with the ready penne pasta as a base, top with pesto, peas, salmon and a sprinkle of Parmesan. Within minutes you’ll have a simple homemade meal, perfect for one or two servings, or double the recipe for the entire family. Penne pasta topped with homemade basil and pine nut pesto, peas, Parmesan cheese and salmon. Cook pasta according to package directions in a pot of lightly salted water. Usually 8-10 minutes. Drain and set aside. 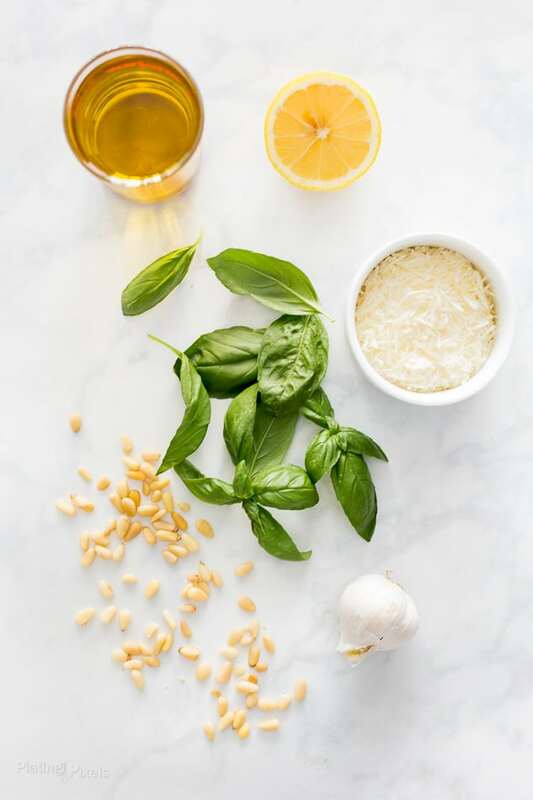 While pasta is cooking: Place basil leaves, cheese, olive oil, garlic, pine nuts, lemon juice, salt and pepper in a food processor. Pulse until smooth and combined, about 1 minute. Split cooked pasta between two plates. Top with pesto, peas and cooked salmon. Garnish with additional Parmesan cheese and serve. Thanks Shamira! Hope you do, the cooked pasta makes it even easier. I’ve never bought canned salmon before. With that and the pasta you used, this meal would be really fast to make! Hi Stacey. Just like the cooked pasta, it handy to have in stock for a quick meal!